"Did you know that collagen production, the main protein responsible for keeping skin firm and supple, slows downs as soon as you hit your early 20s? DUN-DUN-DUN! 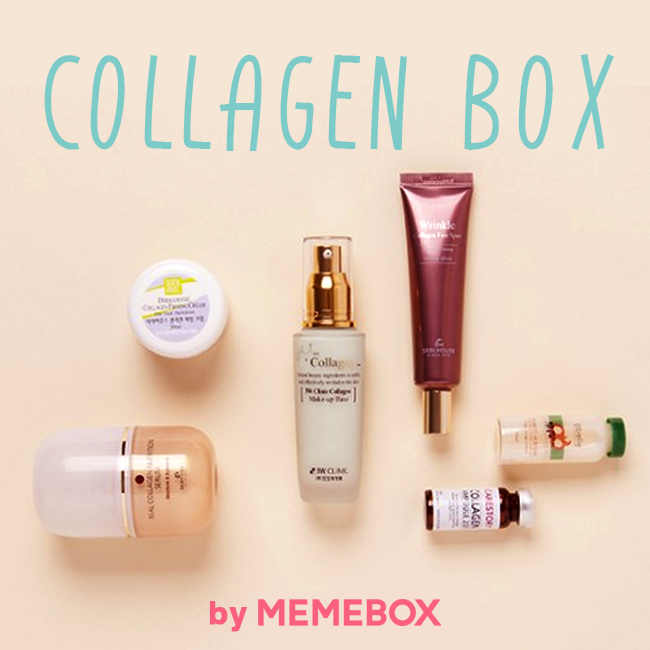 No worries because we’ve got the Collagen Box to stop sagging skin and wrinkles in its tracks! Our box is filled with collagen infused products which are clinically proven to reduce the appearance of fine lines and wrinkles, and our fast acting formulas fight the loss of resilience in skin and plumps skin by supporting collagen production. It is safe to say that you can never do with too many collagen-enriched products; they illuminate and firm the skin, fill up any fine lines, wrinkles, and acne scars, all while helping to maintain perfect elasticity. " Memebox Product Description: "Infused with over 17 different amino acids, this 100% concentrated Collagen Ampoule will deliver intense hydration and facilitate cell regeneration for more supple and firmed up baby-skin. Also, it doesn't smell or feel sticky like your average collagen products, and instead it glides onto the skin refreshingly. Experience the wonders of the real Collagen Ampoule currently being used in Korean aesthetic beauty salons!" How to Use: "After skin application, take a couple of drops of the ampoule and apply it evenly over your face. Gently pat it in for full absorbance." Sadly this ampoule glass broke on transit. I only discovered it just now when I opened up the box to take the ampoule out. All the content have dried up long ago and luckily the other products were not damaged. I emailed Memebox with the photo telling them that I would accept a replacement or points (knowing the latter would be more likely). I got a quick response offering me 5 Memepoints. I know its not the value of the product as listed, but close to the actual value I paid. Also, I'm happy enough to get a swift resolution then to try to get a replacement and let things drag on. Perhaps if it was something that I really, really liked, I would be more demanding (?). 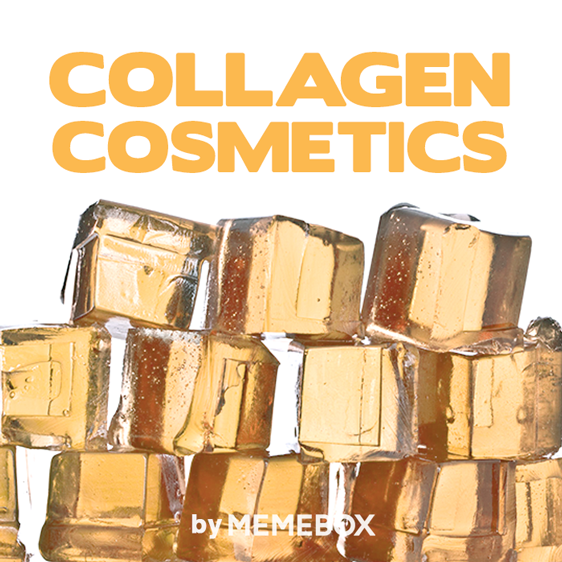 Memebox Product Description: "The abundant collagen, shea butter, and mango shea butter ingredients in the Collagen Firming Cream work to lock in moisture and deliver beneficial nutrients deep down into your skin. With continuous use, you'll experience disappearance of the fine lines and wrinkles and improvement in the skin texture and clarity." How to Use: "Apply the cream generously over your face and gently pat it in for full absorbance." Memebox Product Description: "A deeply moisturizing and nourishing facial serum infused with high concentrates of collagen, Dewytree's popular Real Collagen Nutrition Serum treats enlarged pores, sagging skin and signs of aging with its highly moist and nutritious formula which instigate skin regeneration and renewal." How to Use: "After toner application, apply the serum generously over your face and pat it in for full absorbance." Memebox Product Description: "This silicon type Collagen Make-up Base contains blemish-control powder components for matting out and preparing the skin condition before foundation application. The high level of adherence and long-lasting formula helps maintain your makeup silky smooth all day long." How to Use: "At the first stage of base makeup, pump out the Collagen Make-up Base and apply it evenly over your face." Memebox Product Description: "This wrinkle-care product is packed with collagen and adenosine components for delivering deep, intense nourishment to the skin and nullify the signs of aging by filling in between fine lines and wrinkles. This is not an eye-only cream; it can be applied anywhere else on your skin with visible lines and wrinkles." How to Use: "Before moisturizing cream application, apply the Wrinkle Collagen Free Spot on areas around the eyes, the forehead, and the smile lines, and gently pat it in for better absorbance." Memebox Product Description: "A unique hair ampoule that warms up all by itself and absorbs deeply into your hair, this highly concentrated ampoule is made from E.G.F., hydrolyzed keratin, hydrolyzed collagen, and hydrolyzed silk which all work to strengthen the hair cuticle and make your hair shine with a natural glow." How to Use: "Towel dry after shampooing and apply the ampoule evenly throughout your hair. Place the plastic cap over your head and rest for 5-15 minutes. Rinse off with warm water. It's recommended to be used 1-2 times a week." As with all products I've purchased, I'll come back later to update my blog once I've had a chance to try things out.